Do you want to keep getting traffic on your oldest posts, and make them seem search engine friendly? Customize your SEO with the following steps, so as to get better ranking and make your article rank better in search engines. SEO Optimized articles are the most common way to attract people to your website. Be careful when you have someone else to write for your blog, because lack of knowledge or worst, ignorance can cause quality drops and traffic stability or drop at your website analytics. Just think of that every blog post on your website is like a new website for the search machines, which means that you can always optimize your articles with specific keywords. 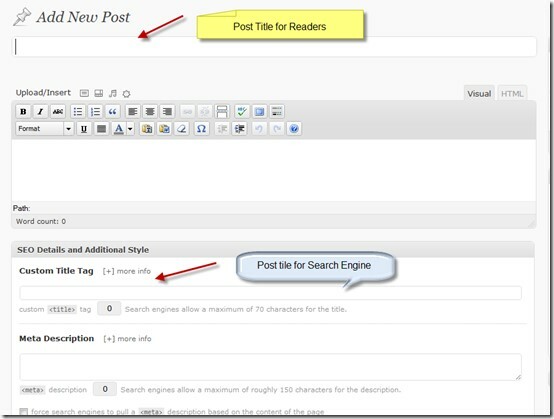 Meta Title is how the reader will read your article at the search engines, as a search result. It’s always better to have one target keyword both in Post Title and Meta Title. Remember: Keep post title less than 66 characters, so as not to be divided at the Google search results. This is one of the parts that most users tend to ignore. Remember that every post you write is very important from both ranking and traffic points of view. As we said before, Google sees every post as a different website, so certain keywords are needed for every posts. Usually, we use generic keywords in our blog posts. This is false, because generic keywords are also the most common keywords, and if someone makes a posts with a title like “Rihanna’s new clip” and uses “Rihanna” as the keyword, it just can’t fight millions of blog posts and results at the Google search. First of all, just think how anyone will search at the search engines to find the specific post. Then get back to your point, and think. If you want for example to search for the new video clip of Rihanna, you should write something like “Rihanna new clip” or “Rihanna music video for X song” or “The latest video clip of Rihanna”, right? So, the first step is to make long tail keywords (f.e. “Rihanna music video for X”), so as to let the other users find your posts easily. Remember to use the keyword search tool, in order to see the Keyword competition or the searches per month, according to the keyword. This may help you to make the best choice for your keyword. Then, use the SAME keyword both in Post title, Meta title, post description and Meta keywords. Also, bold the keywords in your article, so as to have better Google search results. When you write down your post, remember to mention the keywords in the posts. Google and other search engines should see the keywords at the title, at the Meta title and in the content. If it doesn’t see the keywords, it might have an impression that the post is false or the keyword links to a spammed post, and that is something that we really don’t want. It is one of the things that we also usually ignore. We SHOULD optimize the images for keywords. A lot of images have names like DSC0001.jpg etc. It’s always a good idea to give the picture a name relevant to the image itself. For example, if you take some screenshots of your company’s website, give the title “companyscreenshot1” etc. at your picture. 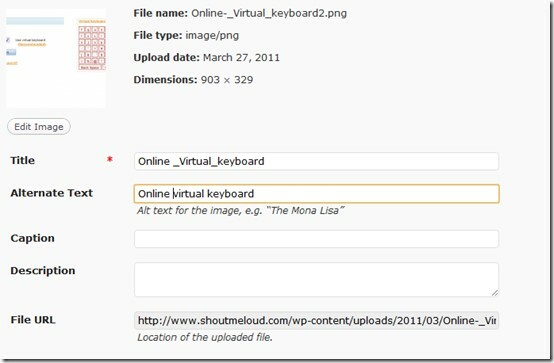 You can also give a description at the alternate text while you upload an image at wordpress. A lot of positive effects can come by using Keywords in image anchor texts, like being at the top of the results at Google Image search. The visitor will click the image, and then will get into your blog post and your website, which means traffic! Avoid writing a lot of stop words, which can cause traffic drop to your website, and also NEVER change your post permalink once the post is published, because users and mainly Google will be frustrated.